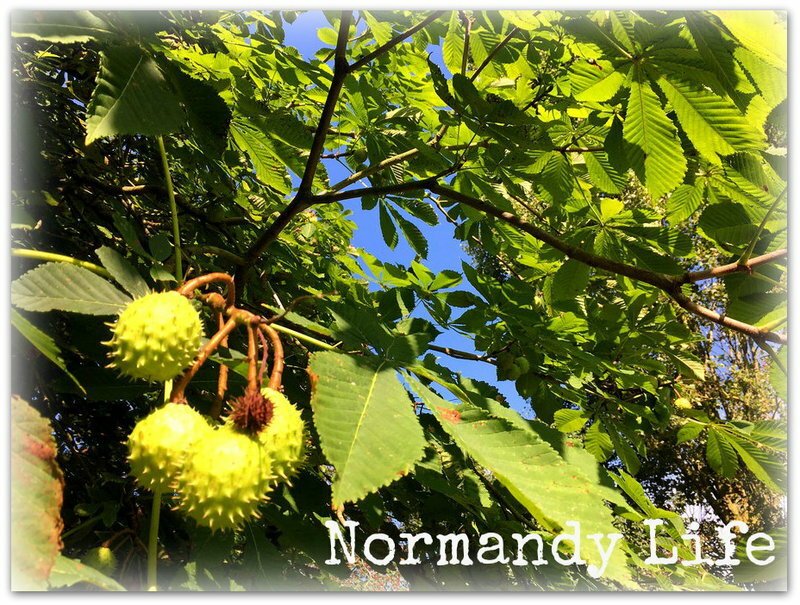 There's definitely a chill in the air these early mornings here in Normandy. Autumn has finally arrived after our wonderully unexpected Indian summer of last week. 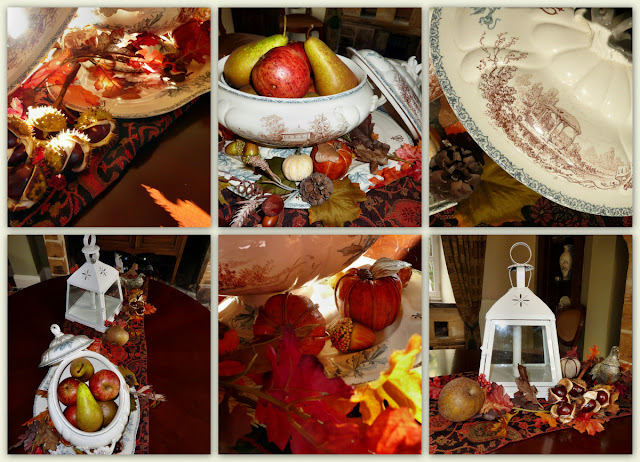 To add a touch of Fall decor to the dining room I used an orange and black paisley shawl as a table runner on the dining table, filled an antique Choissy - le - Roi, Majolica soup tureen with windfall apples and pears and placed it on a matching serving platter. I added faux mini pumpkins, leaves, berries, acorns, real horse chestnuts from the garden, a pair of vintage French, silver plated pheasants and a simple white lantern to complete a seasonal vignette. Photographing the whole table was a nighmare, thank heavens for mosaics! Click on the links or sidebar buttons to visit our gracious hosts. There's been a chill in the air in the mornings here in Wisconsin too. Leaves are gorgeous. Doesn't Autumn just cry out to bring all that beautiful bounty into our homes? Just beautiful. Love the tureen. Lovely day here. I must admit, while it's still rather warm here, the humidity is lower and we had a lovely and comfortable dinner out on the patio the other night. Bad rain this weekend though. You've captured the richness of the fall pallet. Such a beautiful mosaic - inspiring for my thanksgiving table. Definitely a chill in the air here under the umbrella. Thanks for your beautiful mosaic! That definitely looks like fall. The colors are so beautiful this time of year and you used it to make a lovely table with all the fall goodies. Great mosaic. WE came through FRance yesterday and from the Ardeche on we had constant rain. Wanted to stay in Nancy but the weather was too bad so we went straight home and it is good to be hee again. Hi Maggie...visiting from Seasonal Sunday. Your table looks so rich and beautiful to celebrate fall! Your shawl is a perfect beginning to it! Happy Fall! We are celebrating Thanksgiving this weekend in Canada! It's beautiful and you are right in that mosaic allows the eye to be able to take in everything. Your autumn decorations are very pretty and cheerful. I love your tureen, it's so beautiful. Your home looks lovely. I love your pictures too-thanks for going to so much effort in taking them! The mosaic turned out beautifully. No chill in the air here in my part of Oz, and I wish it was Autumn. Lovely tablescape. I love all your Autumn decorations. The colors are so pretty. I also love your header shot. We are having some warm weather right now but it will be rainy and chilly very soon. Lovely photos, have a great wek! The colours of fall are my favourite to decorate with. Your fall table is beautiful. What beautiful and classy arrangements! I love all things fall and your display speaks warm and cozy to me! I love your centerpiece. The colors are awesome! Autumn is definitely in the air and you've captured the colors and textures beautifully in your photos. You've captured Fall. Glad that you became a part of Seasonal Sundays.